AUSTIN, TX--(Marketwired - February 18, 2016) - JP3 Measurement, LLC, announces the launch of its latest technology designed to serve the natural gas custody transfer market. For the first time, natural gas can be easily analyzed to obtain custody transfer-grade hydrocarbon composition, BTU, Relative Density, CO2, and other properties, without the cost and headaches of traditional analyzers. The new Verax CTX delivers custody transfer information for up to four process streams in real time without the need of sampling systems or sample conditioning. The Verax measures with flow cells directly in the pipeline at operating pressure and temperature, requiring no sample transport, sample selection or conditioning systems. The optical Verax analyzer has no emissions, uses no carrier gases, no complex columns or switching valves, and is virtually maintenance free. Further, the technology provides measurement results in seconds as opposed to several minutes which is typical for other technologies. The JP3 Verax CTX for Natural Gas has been certified by a third party lab to exceed the repeatability and reproducibility criteria of common standards referenced for custody transfer such as GPA2261-13 and API 14.1. The Verax CTX product suite is available for immediate purchase, with shipments beginning in April 2016. 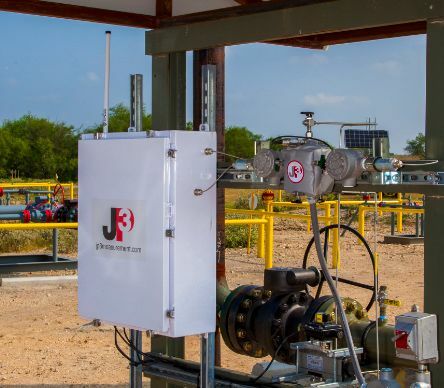 "The release of this product represents a major advancement in JP3's mission to provide high value measurement solutions for natural gas producers, processors and marketers" stated Matt Thomas, JP3 President and CEO. "This product offers the gas industry a highly reliable and low maintenance alternative to traditional analyzers which require highly skilled maintenance personnel and routine replenishment of consumables and parts." Utilizing Near Infra-Red spectroscopy and advanced chemometric modeling, JP3 provides unprecedented measurement capabilities for oil & gas applications including: custody transfer; composition analysis for crude oil, condensate, NGL and gas streams; vapor pressure analysis; specific gravity; relative density; BTU; and many other physical and chemical properties. The inherent design of Verax products provides measurement speeds well beyond competitive technologies along with much higher reliability and lower maintenance costs. Verax ™ is a trademark of JP3 Measurement, LLC. Headquartered in Austin, Texas, JP3 Measurement was founded in 2005 and provides the industry's only field deployable, real time, in-line optical analyzer for both liquid and natural gas measurement. With hundreds of measurement points in the field, JP3 is focused on improving the quality of hydrocarbon measurement and process control for the Oil & Gas industry. For more information, please visit www.jp3measurement.com or contact Gregg Williams, Sr. VP Sales. +1.512.537.8450 gwilliams@jp3measurement.com.